A workshop looking at ways voluntary and community groups can work alongside medical professionals to help improve the physical and mental health of people was held last week (16 January) in Craigavon. The initiative known as 'Social Prescribing' looks at how connecting people with their local communities can improve health outcomes and also aims to support individuals to take greater control of their own health. Support provided though social prescribing can involve a variety of activities which are typically provided by voluntary and community sector organisations. This includes volunteering, arts activities, group learning, gardening, befriending, cookery, healthy eating advice and a range of sports. There are many different models for social prescribing, but most involve a link worker or navigator who works with people to access local sources of support. Over 150 attendees including representatives from local councils, community and voluntary sector, the Department for Communities, DAERA, GPs and MLAs attended the workshop in Craigavon Civic Centre. They heard how over the last few years a number of social prescribing schemes have been developing and gaining in popularity across the UK. They allow GPs, nurses and other primary care professionals to refer people to a range of local, non-clinical services in addition to appropriate medical care. The workshop looked at the different models developing in Northern Ireland, how they are working and how they can support improvements in population health and reduce pressures on primary care services. Opening the workshop, Dr Sloan Harper, Director of Integrated Care at the HSC Board, said social prescribing has a huge role to play in improving the wellbeing of local populations and in delivering the Programme for Government. 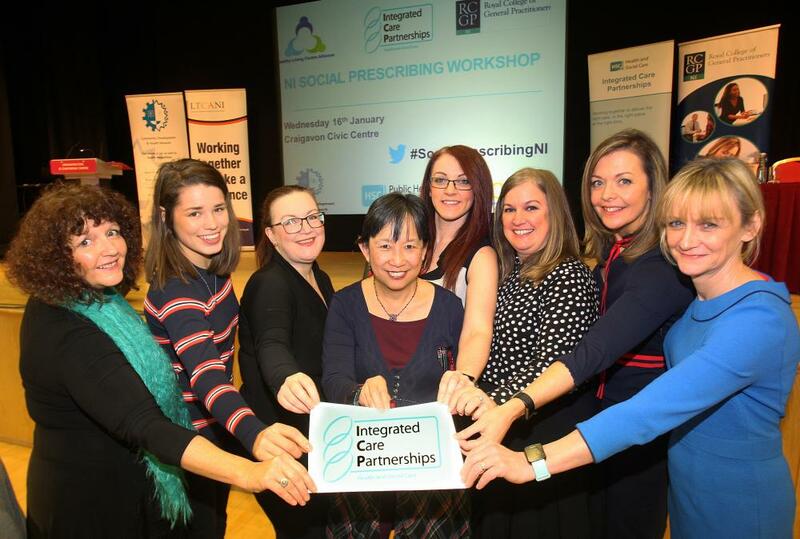 “It is a concept that relies on strong partnerships and collaborations and this workshop gave us a great opportunity to share learning and to strategically examine the role of social prescribing within Northern Ireland. “I see today as a first step in building a learning community around social prescribing and in helping to ensure that as we move forward with social prescribing we do it as collaboratively as possible to make best use of all resources and to meet the needs of our local population,” he said. Among the visiting speakers who shared their learning and experiences were Marie Polley, from the UK Social Prescribing Network, Dr Marcello Bertolli, from the University of East London and Dr Helen Kingston, a GP in Somerset, who set up the 'Compassionate Frome Project'. Recently published results from the Frome Project appear to show that when isolated people have health supported by community groups and volunteers, the number of emergency admissions to hospital falls spectacularly. In this case across the whole of Somerset emergency hospital admissions rose by 29% during the three years of the study, but in Frome they fell by 17%. The panel discussion focused on the key challenge of trying to ensure strategic planning across a range of government departments and there were contributions from representatives from the Department of Health, Ards and North Down Council, Department for Communities, CHDN and the Royal College of GPs in NI. The workshop was organised by Integrated Care Partnerships, in conjunction with the Health and Social Care Board, Public Health Agency and partners, CDHN, Royal College of GPs in Northern Ireland, the Healthy Living Centre Alliance and the Long Term Conditions Alliance.